Fun, Food, Party under the stars with Brice Prairie EMS & Rescue. The 11th Annual Rockin’ the Prairie is August 25th. Doors open at 4:30 with Moniker taking the stage at 5, and Pop Rocks Returns at 8! Tip Boards, Silent Auction, and Prizes through the night. The Big Rockin’ Package is $45, you get a shirt & ticket for you and a friend, plus 4 drinks for you, 3 for your friend. Advance purchase also gets VIP entry at the gate. For 25 years, local volunteers have been removing trash and debris from our local waterways. We want to celebrate our 25th anniversary in a big way. This year, we are going to combine forces with The La Crosse Urban Stormwater Group. Brice Prairie EMS & Rescue will be hosting the CleanUp efforts at the Fred Funk Landing from 8-Noon. From 4-7pm, volunteers and their families are invited to Pearl Street Brewery to celebrate our clean up efforts and become educated about stormwater runoff, and how it pollutes the water in the La Crosse area. Join us for food, refreshments and live music! Who are we: We are Brice Prairie EMS and Rescue. We are your neighbors and co-workers of Brice Prairie. For over 30 years we continue to be a volunteer First Responder organization. What do we do: We respond to 9-1-1 calls on Brice Prairie and the Great River State Bike/Snowmobile Trail to provide first-on-scene emergency medical care, water/ice rescue for Lake Onalaska and the Black River Bottoms, and provide mutual assistance for nearby area emergencies. What we need: Brice Prairie First Responders will be holding their 10th annual “Rockin’ the Prairie” fundraiser featuring the musical act “Pop Rocks” on Saturday, August 26th. BPER holds this event in an effort to raise funds to help cover the costs associated with running the organization. These costs range from continued training for our volunteers to the purchase of needed equipment and supplies. This year we would like to put all volunteers through an advanced skills class, purchase an airway dummy, and improve our water and ice rescue equipment. We would appreciate your consideration of a donation to help us achieve our goals. The Brice Prairie First Responders would like to thank everyone for you support of our annual Rockin’ the Prairie party. Your support allows us to purchase equipment that could help save a life. Past purchases include an inflatable ice rescue boat, newer vehicles, further training, upgrades to our communication equipment to meet new FCC mandates, increased training, a new (to us) Rescue Vehicle, and capital improvements to our facilities. The Brice Prairie First Responders do accept donations and have annual fund-raisers to help pay for expenses and equipment needed. In the past we’ve sold raffle tickets, sponsored a bass tournament, held chicken-q’s, had a dance, and placed a chain link bin next to our building to collect aluminum cans. Donations may be sent directly to us. Thank you for your continued support. Because of your generous donations, the life of your neighbor, a family member, or even your life may be saved. 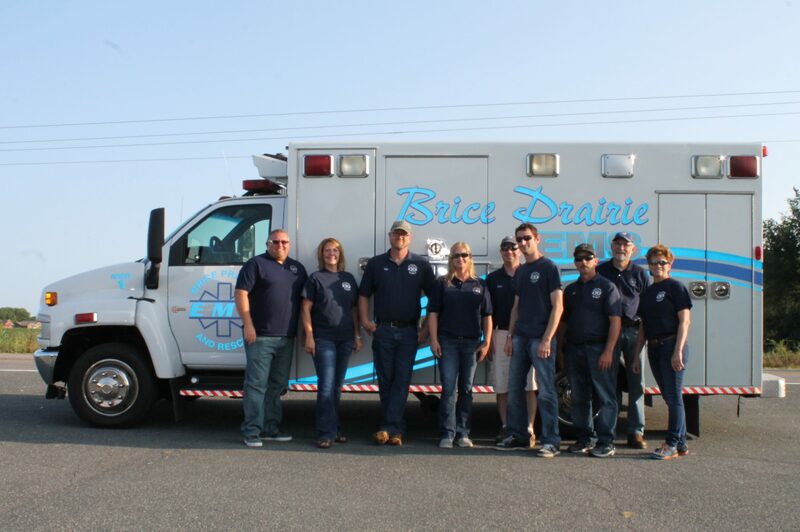 The Brice Prairie EMS & Rescue participates in numerous opportunities to serve our community. We provided EMS coverage at the Annual Brice Prairie Canoe/ Bike Races, participate in the Spring Mississippi River Clean-up, and stand by at the Wisconsin High School Rodeo events at the Coulee Region Riders Club. If your group or event needs trained emergency response personnel that can emergency medical care prior to the arrival of an ambulance, please contact us.